Failure to launch: Two rocket launches don’t go as planned. A SpaceX experimental test rocket self-detonated shortly after takeoff last week. Click to embiggen. Photo by @EthansMommy17 on Twitter, used by permission. It hasn’t been the best week for uncrewed space launches. 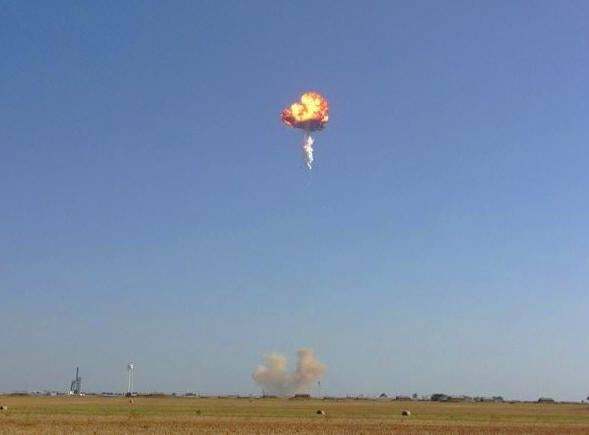 On Friday, Aug. 22, 2014, SpaceX was testing a new configuration of its F9R vertical launch and landing rocket—essentially a Falcon 9 first stage booster adapted to land on its tail after launching a payload into space—when something went wrong. It was already a few hundred meters in the air when the software onboard detected the malfunction and aborted the mission by exploding the rocket. This is done to prevent the possibility that an out-of-control rocket might fly off and injure someone. Earlier today, in McGregor, Texas, SpaceX conducted a test flight of a three engine version of the F9R vehicle (successor to Grasshopper). During the flight, an anomaly was detected in the vehicle and the flight termination system automatically terminated the mission. With research and development projects, detecting vehicle anomalies during the testing is the purpose of the program. Today’s test was particularly complex pushing the limits of the vehicle further than any previous test. As is our practice, the company will be reviewing the flight record details to learn more about the performance of the vehicle prior to our next test. SpaceX was scheduled to launch AsiaSat 6 into orbit on a Falcon 9 today, but after the test problem this new launch has been pushed back to Wednesday, Aug. 27. The hardware involved is very different, but they want to make sure there’s no risk to the AsiaSat 6 mission. Galileo is the European version of the American GPS satellites, with 30 satellites set to eventually comprise the entire fleet. This failure to get them into orbit is a serious issue; the same rocket system is planned to launch four more pairs, but that will have to be put on hold until the problem is resolved. A dozen more satellites are planned to be launched by a different rocket sometime later. So, this has been a rough week for space travel, but these things happen. No one was hurt, which is good, and hopefully the problems will be analyzed, understood, and quickly fixed. This is, after all, rocket science.